I like labeling myself as an “unschooler”, but often I’m interested in explaining what I’m going for with my parenting to people that don’t already have a detailed and nuanced model of what unschooling is! My best description of what unschooling means to me is that I’m pursuing a high trust high investment strategy. I think most of my parenting decisions can be derived from those two principles. Unschooling advocates often talk about trust. Peter Grey, who talks abut “trustful parenting” in his book. And John Holt summarizes his approach as “trust children”. The sort of trust I’m talking about is more a characteristic of a relationship than a characteristic of a person. If a friend of mine who didn’t know Lydia well asked me “how much should I trust Lydia?” I wouldn’t have a clear answer. I could share a detailed model. I’d trust her to know what’s physically safe for her, I’d trust her not to physically hurt anyone. I’d trust her to give accurate answers about whether a toy belonged to her or her brother. I wouldn’t trust her to know which direction the playground was. I wouldn’t trust her to supervise her little brother around a dangerous object. I wouldn’t trust her to accurately predict whether she would pee if she sat on the toilet. But to me, having a trusting relationship with Lydia doesn’t rely very much if at all on tallying up the ways in which I can trust her. It’s more of an attitude that I trust that she’s doing the best to make sense of the world given the constraints she’s experiencing, whether they are legible or not. It means that if she says something is important to her, I believe her, and if she acts like something is important to her, I believe her. Even if she can’t explain it and it doesn’t make sense to me. I trust that there was something important going on in her brain when she wanted to watch videos of people taking toys out of eggs and talking about them, and wanted me to put her toys in plastic eggs so she could take them out. I have theories about what was going on with that, but my trust isn’t contingent on the theories seeming likely to be true. If my kids are doing something that’s inconvenient or frustrating for me, I make sure to consider solutions that involve me changing and doing work, not just solutions that involve them changing and doing work. I’ve been willing to do stuff like sleep with my kids as long as they want, nurse for years on end, carry them around a bunch, and fill my house with toys they enjoy, even though it takes work to organize them and clean them up. I hesitate to write all that stuff, because it feels like I’m bragging or something. There’s an overall cultural narrative that it’s good to do stuff for our kids. (And naturally a complementary narrative that it’s bad to do too much for our kids.) There are also lots of things I don’t do for my kids. And I expect to invest less time in each kid as they get older. My resources are limited, and I spend some of them on other stuff too! Right now, I’m writing a blog post while they’re both with a babysitter they like, and that seems fine. But it seems worth mentioning that it seems intuitively correct to me to invest a pretty large chunk of resources in my kids. I also don’t mean that I feel like I’m investing more than people in my rough reference class. I think most people invest a bunch these days. But by historical standards, I think we’re all investing a lot, so I don’t want to take it for granted! Articulating my parenting values seems useful for a bunch of reasons, and a big one for me is that it makes it easier for me to have useful and respectful conversations with people who do things differently. I’ve found that when I’m doing things differently from my friends, lots of the time it’s just because we have different circumstances and comparative advantages. I have multiple friends who feel happier and more energized when they get out of the house with their kids, so they think of fun stuff to do. I tend to feel more sane if my kids and I spend a lot of time at home, so I try to think of ways to make staying home fun. I have friends that have done soul searching about how to support their kids when they want to do physically dangerous things. I tend to be encouraging my kids to try things that are a little outside their comfort zones, because so far I’ve had pretty cautious kids. But sometimes things really do seem to boil down to value differences, and the ones I’ve listed above are the ones I’ve encountered and recognized most often. For example, there’s a paradigm that seems coherent to me where at younger ages, the parent prioritizes the kid obeying and submitting more than trusting. There also seems to me to be a coherent position where people think there’s something unbalanced and bad about investing as much in our kids as modern society seems to encourage. So, if I have a deep disagreement with someone about parenting, the two values I listed seem like the most fruitful areas to explore. How To Talk So Kids Will Listen & Listen So Kids Can Talk is a parenting / communication book written by Adele Faber and Elaine Mazlish. 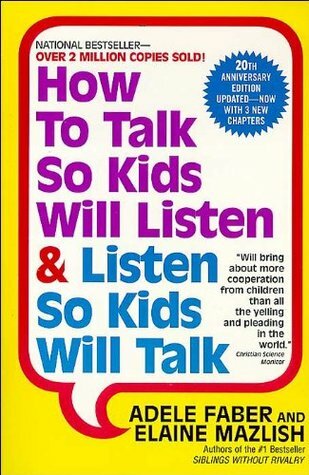 While this book is specifically intended for parents to have better relationships with their children, the vast majority of the advice contained within applies universally to all interactions, and I have written this summary specifically to abstract away from parent-child relationships. I consider the first chapter alone better at helping people internalize the principles behind nonviolent communication than Rosenberg’s entire book. HTTSKWL is currently by far my most highly recommended communications book, and because it is appealing to parents and children it is a remarkably easy read. Note that unlike most books, this one contains a very high ratio of exercises and prompts and anecdotes relative to its advice. The authors recommend going through the book slowly, and doing all the exercises. This summary will only contain their explicit instructions – I highly recommend buying a copy of the book and completing it. The many specific example conversations will give a much better understanding of the principles I lay out here than I can convey in a summary. I don’t have time to write something long this week, but I did want to pose a question that’s been on my mind. When someone you care about wants something and you have mixed feelings about whether to give it to them, what are your heuristics for deciding what to do? Do you have an internal voice or feeling that you trust to guide your decisions? Do you try to calculate how much it matters to each person, and if so is that process explicit or implicit? Do you like the way you think about these questions? It’s possible that the question I’m posing already assumes an unhelpful frame, and I think it’s true that there’s often low-hanging fruit in the category of win-win solutions. But I’d love to hear people’s answers anyway. Any and all thoughts on the subject are welcome. I want to try to point at and describe a particular phenomenon I’ve often seen in relationships: testing. While I’m more familiar with the ways women test men, and I would never claim the testing is on average totally symmetrical, certainly men test women as well. This post will be about the ways that most women seem to test most men. By my standards, I’d say that a “communication” strategy qualifies as a test if the tester is exerting any optimization power in the direction of confusing her partner. Asking for one thing with words and a separate thing with body language and context is a very broad description of how testing often works. Taking the request at face value and granting it may be a quite unsatisfactory response. A classic test that the PUA community likes to talk about is one where a girl will ask a guy to hold her purse, but in fact respect him a bit less if he complies. An example that sees very central to me is that a woman will hit on, by accident, an emotion of hers that seems to throw her boyfriend off-balance, and then keep serving it up to him, basically looking to get a different, less reactive response. Perhaps testing is the wrong word. These tests are usually at best semi-conscious. But I’m sticking with the word because it feels descriptive, it lands with me, and it’s landed with other woman that I’ve talked to. Empathy and introspection will reveal that no resolution that precludes the guy learning a new skill feels satisfying. I spent some time this past week trying to pin down a particular dance move one guy I was talking to was missing. I tried unsuccessfully for a while to describe non-reactive compassion, but I’ll take a stab at it here too. When we humans are suffering, typically there’s some tangle of meta-emotions. Single emotions are negative affect, but they rarely last long on their own. But add some shame into the mix and they become much harder to sort out. If I were overstating my claim a bit, I’d say that all extended triggers involve shame of some sort. Luckily, this diagnosis suggests a solution. As a listener, if we can manage to communicate that we are as close as possible to fully aware of what’s going on with the other person AND we’re okay with it, it goes a long way. Curiosity, openness, reflecting back emotions and needs verbally and, more importantly, nonverbally, will show the awareness. A calm, somewhat compassionate, perhaps even affectionately amused face will communicate that we’re okay with it. And building the muscle of being okay with ever more and weirder twisted human social/emotional strategies is one of the easiest ways to better the lives of those around us. Note: If the suggestion that you’re testing your partner lands at all with you, I highly recommend acceptance and conscious strategy. For me at least, testing seems to be a pretty fundamental drive, for better or for worse. I can tell an ev-psych story that makes me okay with it an a naturalistic way, and once I’ve stopped feeling shame about it (see above), I can usually make sure the channel the drive in useful ways. Tests he can pass are fine. If he repeatedly doesn’t pass, I need to either make it easier and gradually ramp up the intensity to build the skill, or coach him somehow. Coaching in the moment or at different time are both workable. I’ve had a plan to blog about something related to personal growth every Monday. I’ve managed this the last two weeks, and I’m doing it again today. I read an IFS book about relationships a couple of years ago that had an articulate explanation of why strong feelings are always about us, never the other person. Will and I just hosted an NVC webinar, where we talked about the importance of taking responsibility for all of your feelings. The basic idea is that even though there are external triggers that prompt us to feel emotions at certain times, something always happens in our head between our sensory perception of what happened and our reaction to it. And we have control over that something that happens. We can change our narrative, and therefore change our feelings about a situation. While this principle basically always holds true, today I’d like to focus on the specific case of really strong feelings. One heuristic I use is that if a reaction seems disproportionate, it’s because the person isn’t actually reacting to the situation at hand. If I get a little annoyed at my roommate for eating my cheese, ask her not to do it again, and forget about the whole thing, I think it’s basically fair to say that I was annoyed about the cheese. If my roommate eats my cheese and I’m in tears (yes, I’ve done this…), there’s something else going on. I’m pattern matching my current circumstance to an unresolved incident, probably from my childhood. If someone says or does something that makes me feel absolutely terrible, I always try to remember that whatever the trigger was can’t possibly be what I’m really upset about. It doesn’t make sense to say that I’m in a really bad mood “because my friend was late” or “because Will joked that ‘you only think of yourself’ when I didn’t unplug his power cord for him”. It doesn’t make sense to frame it that way, because I’ll never actually be able to resolve my emotional state by focusing on the trigger. Setting up my life to avoid situations that pattern match to the past probably won’t work, and (in my opinion) would be counterproductive even if it did. Because the trigger brought my attention to some emotional pain that was already there. My model of how this works is that actually feeling better means owning the feeling and opening up emotionally. In doing so, my mind will naturally go back to the original incident where I created a distorted narrative instead of processing the emotion. Once I can see the mental movements I’m going through, it’s not usually hard to change the pattern. So, if you find yourself complaining, either to yourself or out loud, about how bad someone made you feel, or about how much someone is making your life difficult, try getting curious about what’s going on underneath the surface. And if you can manage it, try feeling grateful to the other person for drawing your attention to something that already a problem. Last month, Will and I hosted a webinar on how we stay close and happy in relationships. Two of our friends posted awesome notes. Here they are!